As I write my President’s message for this quarter, I reflect on yesterday’s Steeplechaser activities. I started my day by running 10 miles with the half marathon training group. Led by their coach, Josh Roane, there were approximately 12 runners who came out to join the group run. The course weaved through the beautiful Frederick county roads. Conversation and catching up were had by all. The ten miles flew by. After the beautiful morning run, I attended the Steeplechaser annual picnic. I met new runners, runners who have been a part of the club for years, and runners who had raced that very morning. We laughed together, celebrated together, and even played a killer kickball game. Being a part of this running club is not just about running; it is about sharing stories and enjoying one another’s company. Runners are delightful people, and that is why I surround myself with those who love to run. We are lucky to be part of such a wonderful running family! On Wednesdays throughout the summer, Tim O’Keefe organized our decathlon series. Although there were a few hiccups with the locations, we still had a decent turn out. The awards were presented with flare at our annual summer picnic. Thanks Tim for all of your time and dedication to the decathlon. Harriet Langlois, the Women’s Distance Festival 5k race director, organized another successful run for our ladies. 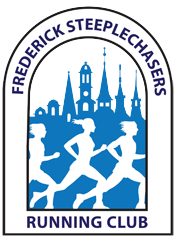 417 runners completed the race, and $16,223 was raised to benefit the Frederick Women’s Giving Circle. https://www.frederickwdf.com/ Many new runners came out to enjoy this beautiful day of running. There were smiles and feelings of accomplishment at the end of the race! 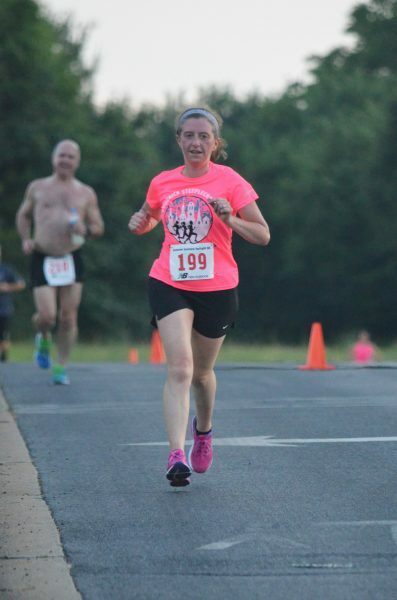 On July 1st, 111 runners participated in our new low key race, Independence 5000. Thanks to Victor Cretella for organizing! This was a fun out and back race with creative awards. We had a great turn out. I can’t wait for next year. Throughout the summer, Syble Roane, Heidi Novak, and Nikki Martin, worked together to coach the Steeplechaser WDF 5k training program. We were fortunate to have these dedicated ladies coaching our runners. Billy Clem is hard at work coaching our marathon training program, and Josh Roane and Crystal Tressler have stepped up to train our half marathon group. Thank you for the hours you spend to make sure our runners are ready for their upcoming races. These training programs are some of the best around! We are excited to announce our new youth running program. Thanks to Mark Lawrence for all of your guidance in preparing for this program and to Trevor James, our new youth running coach, for taking the lead. The season started on July 5th. Watch for our Spires to be running throughout the community! In conclusion, as the summer comes to a close, reflect on your running and enjoy and appreciate the people you run with and have gotten to know in our club. It is the best club around, and I am proud to be a Steeplechaser..